I haven’t always loved Minecraft. Actually, I was afraidthat I would love it too much. This year at the ALC I decided I would get more involved in playing games with the kids. I’d tried to avoid playing Minecraft for the first year because I felt that on the one hand this area of interest was already well represented by other facilitators (Ryan, Drew) and that the choice not to play was a powerful one in that it meant I was always engaged in and modeling my other interests. I play guitar, I love dancing, I love reading and discussing Philosophy. This year, however, that logic was shifted by my new role as After Hours carer. The kids that I’ve been spending consistent time hanging out with (Jiana, Sterling) have been so deeply involved in the game that it seemed like a great time to get started. Besides, there was a whiff of paternalistic disapproval in my not playing, which on reflection was probably more about managing expectations about my own behavior (I love playing games) than anything. I experienced a state of flow for much of that time. I probably could have done much more, in the game, with that time. Can I use the tools and practices of ALC self-directed learning to play a video game, to master it without it mastering me? Ever since I’ve been involved with the ALC project, at that first ALF Summer (2014), I was told that in order to work in this context, I needed to create my own role. This was not a place with readily available jobs to be filled. It is a community based project where needs and opportunities are being expressed, and where individuals need to be attuned to ways that they can show up powerfully as themselves. Suffice it to say that the only person who can answer any of these questions effectively is the person asking them. To expect anyone else to resolve this is both expecting a lot from other people’s time/energy and avoiding the very personal journey that self-directed learning enables and requires. Me: what work can I do to be of value to the community? Tomis: I could tell you things that I wish someone was doing, but then you probably wouldn’t want to do them if I told you. Me: ok, but, like what? Tomis: fundraising. grant writing. enrollments. Me: I could do those! [minutes later, thinking about it] yeah, but I’m not that interested or excited about doing that work, and that means I’d probably do a pretty poor job of it… wait! oh. I get it. Not surprisingly then, these roles are now being filled by people who are interested in that work. The community had always been making these needs known, perhaps in subtle ways but more likely as vacancies that people with the right eyes and interests could see clearly. Fortune favors the prepared mind, and all that. So, it seems, the more committed to my personal goals and journey I’ve become, the clearer the next steps have been. I want to open an ALC in Australia, but the range of skills and experience that I will need to achieve that are broad. Over the past year and a half I’ve started a weekly community dance event. That has taught me how hard it is to get something community oriented off the ground. Even a great idea needs tons of elbow grease. It has also taught me that without the support and commitment of at least one other person, I would probably have given up on it at some point: everyone has ebbs and flows. Burnout is real. On the more personal level I’ve squarely faced the challenge of whether I can set myself goals and succeed in something without a shove from someone else: does self-direction work for me? Over the summer I decided to push myself and become a good swimmer. Swimming is always something I’ve loved, but I couldn’t say I’m great at it. Now I can say, with pride, that I am (though I still haven’t taught myself Butterfly). I won first place at my pool for the most laps swum during the Summer. I even earned a trophy. Achievements and external validation are great but it only happened because I chose to make it happen. Fitness wasn’t my goal, the practice was – getting faster, more efficient, fewer strokes per lap, stronger kicks, better flip turns – these were my goals. Eating poorly meant less energy for swimming. Sleeping late meant missing pool time. Health and Fitness were by-products. What do I need to know first about starting a community organization? Do I have a good example of self-directed learning in my own life? So now, to return to the topic of Minecraft, I’m trying to see if I can play a video game in a mindful manner. Can I use the tools and practices of ALC self-directed learning to play a video game, to master it without it mastering me? This is a key question, because I see that many of the kids are choosing to play computer games and during intention setting we are constantly asking kids to be more specific about what they are going to do in Minecraft. Elsewhere, others have written about digital literacy and the skills these kids are developing in the virtual realm. I am not concerned with this. I have seen kids exploring collaboration with each other, as well as ‘griefing’ each other and generally developing all of the intricate social skills that are required to navigate friendships and people as people, thru playing Minecraft. Likewise, I have already seen that the kids are becoming more specific about what they are doing and that this has helped them to play more mindfully. I’m also not so much concerned with this (how others are playing Minecraft). I AM concerned with my own ability to structure my play time in a constructive way. 3. Do the tools and practices actually help to structure and manage your time effectively? Another question I need to resolve is what self-directed learning looks like in a social context. The very nature of my ‘second key concern’ meant that I chose an activity that was solo: swimming. Already I’ve found many instances where I’ve been lifted up by the kids in terms of my Minecraft knowledge. 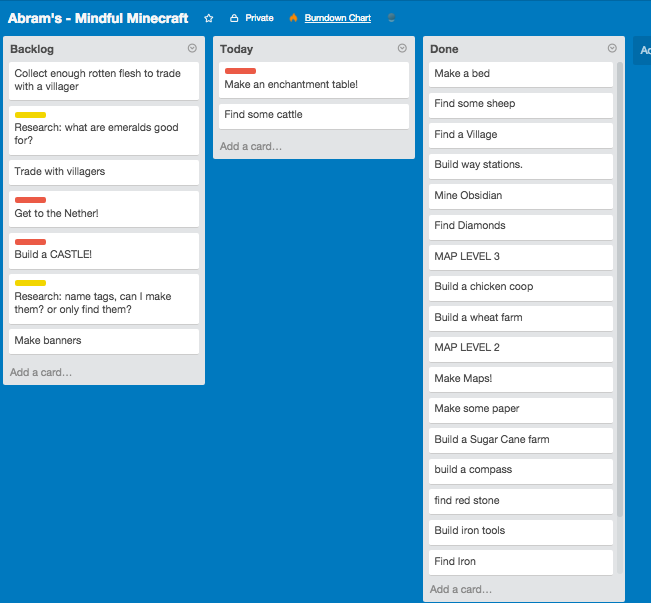 This is what makes Minecraft the perfect tool for me to explore the social experience of ‘self-directed’ learning: this is an area of knowledge where I am already surrounded by many experts (@timotree, @douglasawesome, @ryanshollenberger, @agilealfie to name a few). 4. How is self-directed learning helped or hindered by a group setting? I’ve already created the world that I will play on. Actually, I’ve stopped and started about 7 different worlds before I had my 7 hour binge playing session on the current one, so at his point I’d say I’m a Novice not a total n00b. My current goals are going to reflect that. I must document the playing and blog about it. For the first session I played for an hour, with a seemingly simple goal: to find cows to farm in order to collect leather. I already knew that cows were pretty rare in this world and so I ended up calling on my friends to help me find them. 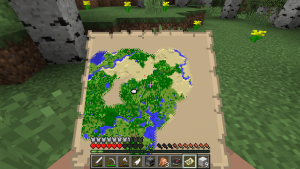 I already had some advanced maps to share to aid in the search. But that is the topic (and title) of my next post: Episode 1. Where’s the Beef?? This is such an amazing post, it really captures so many facets of the journey of self directed learning. It’s been really inspiring seeing your journey unfold. I think this highlights a core concept that can be easily missed concerning video games: Intentional play. That, in my mind, is the big take away in many cases. To learn how to do anything intentionally is key and you draw that parallel through the example of swimming. The same skills it takes to get healthy are what we try and “teach” through intentional play. When people (like Jane McGonigal) talk about ‘gamification’ they are talking about applying those (old) assumptions to other areas of our lives. The overly structured “carrot” approach to gaming – where you are always aware of the next goal and level-up and that this is structured by the gameplay – may be a key to the addictive nature of the games, but it is also NOT (imho) what makes games great. Minecraft, being a sandbox game (also I may do a series on *Prison Architect* for this reason and the fact that kids at school are getting into that one), directly challenges those assumptions about gaming especially because of it’s cultural (and now also financial) success.